5 Star Electrical LLC > Electrical Services Blog > Don’t Make These Electrical Wiring Mistakes! It is said that making mistakes is the best way to learn, but when it comes to mistakes with long-lasting consequences, that is far from the truth. One of the joys of owning a home is delving into home repairs and improvements on your own. However, if you want to keep your home and not face a huge medical bill, don’t make the following electrical wiring mistakes! Don’t resolve a frequently tripped circuit breaker by swapping out the 15-amp breaker for a 20-amp one! There are two reasons why this is a bad idea. The first is that frequent tripping indicates a problem that should be addressed. Don’t assume it is just that there is too much draw as it could also be a short in the electrical wiring that could create a fire. The second is that the higher amp breaker now can handle the added load, but the wiring can’t and overheating and fire are a huge risk. Don’t replace any outlet, switch, or fixture without shutting down the power at the breaker box! It doesn’t matter how careful you are, one wrong move and you’ll get a jolt of electricity that at best will hurt and at worst can cause heart failure. Always test for power even after you’ve shut off the breaker to be sure you got the right one before you get started. Don’t attempt any electrical wiring if you don’t have the expertise and proper tools! It is always better to hire a professional for anything but changing a lightbulb, and that is even risky in some very unusual cases. You don’t want to risk an electrical fire, injury or death from a shock, violating building codes, or causing more damage to your home than you started out with. 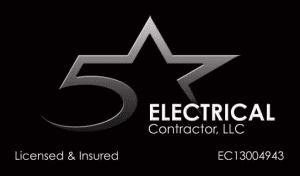 Here at 5 Star Electrical LLC, we are equipped to handle your electrical wiring needs in the proper manner, saving you the risks involved with attempting repairs on your own. We offer installation, repair, and re-wiring services throughout the Tampa, Florida area. The biggest mistake of all is not calling us for your electrical wiring needs!